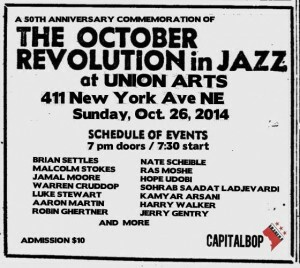 Almost two weeks ago Sohrab went to DC performing at The October Revolution in Jazz event at Union Arts curated by Luke Stewart and attending the two days 14th Future of Music Policy Summit at Georgetown University. Future of Music Coalition (FMC) is a U.S. 501(c)(3) national non-profit organization specializing in education, research and advocacy for musicians with a focus on issues at the intersection of music technology, policy and law. 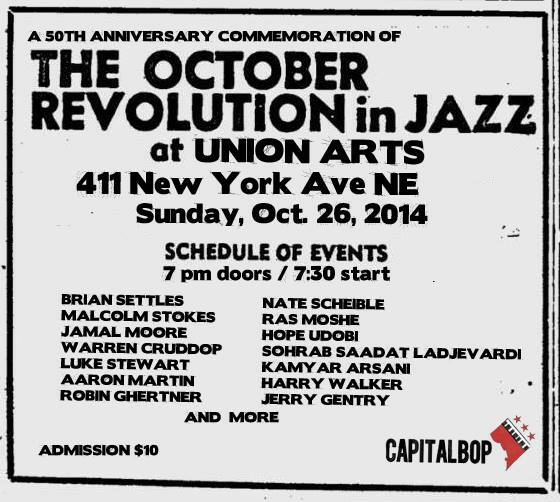 Last month of October marked the 50th anniversary of the October Revolution in Jazz, organized by trumpeter Bill Dixon in New York City. 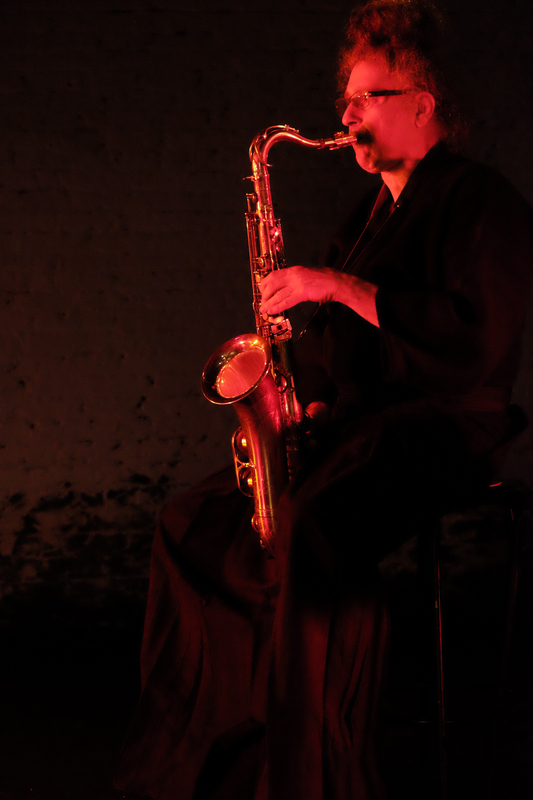 The goal was to provide a platform for musicians dedicated performing original and improvised music, but were not able to find steady work in this approach. 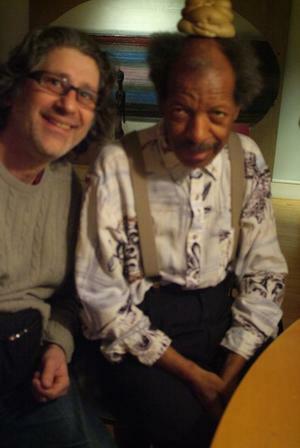 It ultimately lead to the creation of the Jazz Composer’s Guild and was another important statement in organizing musicians and artists in practicing self-determination in their artistic careers and in the community. For this performance, musicians from DC, with Sohrab as a special guest from New York City collaborated in a series of duo performances. This is in recognition of a historical event, showcasing a community of musicians who have been influenced by the October Revolution. Musicians included, Sohrab, Kamyar Arsani (SoSaLa DC music collective), Brian Settles, Aaron Martin, Jamal Moore, Jeron White, Warren “Trae” Cruddop III (SoSaLa DC music collective), Luke Stewart (SoSaLa DC music collective), Nate Scheible, Patrick James Cain and more! Here is a video with Sohrab on tenor sax and Patrick James Cain on tenor sax and cassette player. Here is a video with Sohrab on tenor sax and Brian Sattles on tenor sax. At last year’s Summit, Jazz Forward Coalition (JFC) and FMC brought together an outstanding group of thought leaders and stakeholders to re-examine jazz’s unique and essential role in the socio-economic cultural arenas. 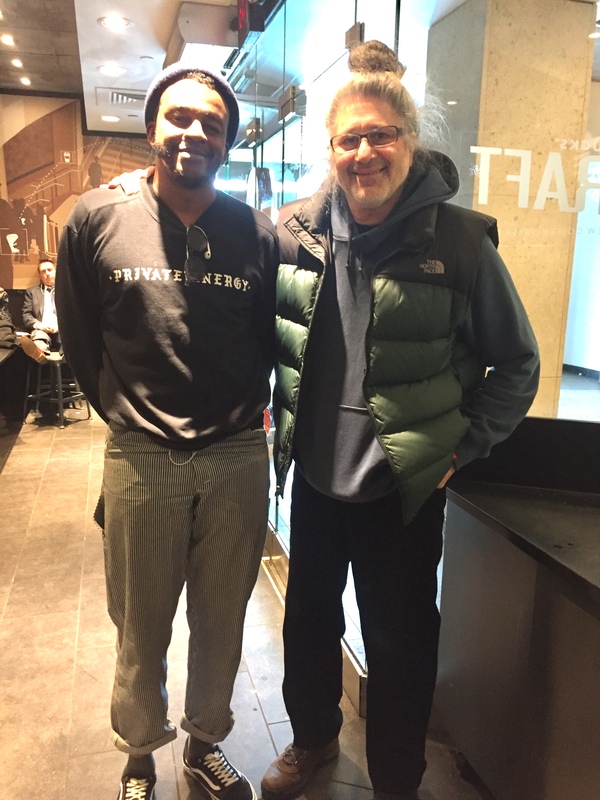 It was an animated, sometimes heated, but ultimately productive discussion, which began to suggest a roadmap to address jazz’s needs for sustained growth. Since that time, JFC has embarked on a year long study, supported by a planning grant from DDCF, to take a snapshot of jazz in order to delineate, define and suggest programmable initiatives for community based activations. Please join us as we examine the interlocking needs of the jazz ecosystem, discuss fresh ideas that bring more jazz to more people and strategize how to mobilize and execute on the local and national levels. This session will present our ‘Road Plan for Jazz’ through the intertwined lenses of professional development, advocacy and demand building. Kiran Gandhi is a force of nature. She plays drums and tours internationally with M.I.A., has done a stint at Interscope Records as the company’s first digital analyst, is a Harvard MBA candidate and a committed activist. Most exciting is her commitment to a more diverse and inclusive music industry built on an ethos of collaboration and engagement. Kiran’s talks on “atomic living” embody her willingness to experience life and the pursuit of knowledge wherever opportunities arise. She’ll be joined in conversation with one of our favorite rising legal stars, Michelle Davis, a former Flagpole music editor and FMC intern who in her “spare time” works to expand the knowledge base of musicians in her hometown of Athens, Georgia. These two young leaders possess intellectual curiosity and a desire to affect positive change through music. That’s our kind of future. Pundits and prognosticators often surmise that today’s musicians and composers are living in an era of unparalleled opportunity. While it’s safe to say that musicians’ access to the marketplace has greatly improved, thanks to digital sales, social media, YouTube and the like, how have these changes impacted musicians’ ability to generate revenue based on their creative work? Almost all analyses of the effects of these changes rest purely on assumptions that they have improved musicians’ bottom lines. We hear often from record labels, music services, publishers, and entrepreneurs about the state of the music industry. Now it’s time to hear how musicians and composers themselves are navigating these enormous changes. In this conversation we will look at how revenue streams for an acclaimed soul singer who has worked in the industry for 50 years have and have not changed since the 60s, and the importance of transparency and reliable accounting for artists. A session on organizing your music community to find its power, create change and succeed. How can we as musicians develop power in today’s industry and protect our work and our careers? Join the American Federation of Musicians as we share the experiences of the Content Creators Coalition (C3) and demonstrate the varied approaches the AFM takes to help us to turn our own music communities into a force for change. Our future depends on it! The Future of Music Policy Summit was two jam-packed days of speeches, panel discussions and interviews. 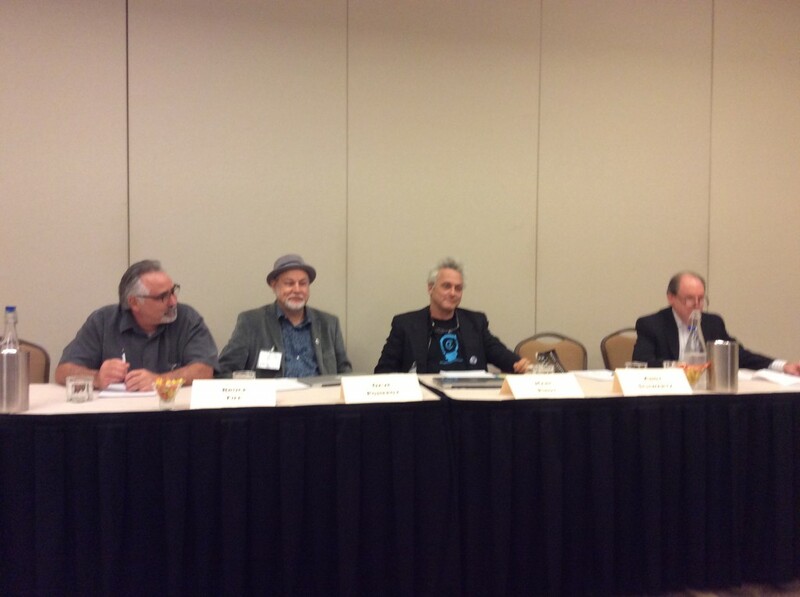 The summit was a place where all perspectives of music business and musicians’ issues could be heard. The dialogues were very constructive (sometimes too much), focusing on the real challenges and opportunities in today’s music world. He enjoyed mostly the Do It Together! panel discussion with music activist and guitarist Marc Ribot who “urgently and passionately emphasized how important it is for musicians to organize as workers together at all levels, to not be afraid to protest, to go on strike, to be unafraid to fight and push aggressively for legislation to be passed to protect musicians.” He was the only music activist during the two days who was most specific on how musicians – as a lobbying force – can achieve their goal of fair pay in the digital world. Generally speaking, Sohrab enjoyed the two days which were very informative and inspiring. He had a chance two meet, talk and exchange ideas with following panelists and new friends: Bruce Fife (International Vice President, AFM; President, Local 99 Portland, Fair Trade Music), Dave Pomeroy (president of the Nashville Musicians Association), Marc Ribot (Content Creators Coalition), Andy Schwartz ( Local 802 AFM), Tom Silverman (The New Music Seminar), Karin Wolf (Arts Program Administrator At Madison Arts Comission), Dave Mallen (Innovation Station Music, DC), Chrity Crowl (promusicdb.com), Cheyenne Hohmann (WFMU FM, NJ), Ken Francis Wenzel (singer-song writer), Martin Perna (antibals) and Luke Stewart (WFPF FM), Peter Gordon (Thirsty Ear Recordings and Jazz Forward Coalition ) and Rebecca Gates (The Consortium, Portland). All these people showed interest in Sohrab’s music activism and in his Enough Is Enough NY campaign. Promising their support and wanting to stay in touch with him.